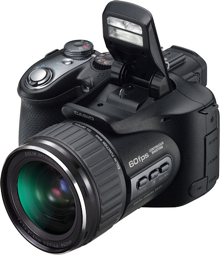 The Casio EXILIM Pro EX-F1is a 6 megapixel super zoom camera with a 12x optical zoom lens and a 2.8 inch LCD. The Casio EXILIM Pro EX-F1 is a full high definition camera features an high speed CMOS sensor that allows ultra high speed burst shooting at 60 frames per second, and high speed full HD movie recording at up to 1200 frames per second. You also have the ability to adjust the shooting rate. ISO range of 100 – 1600 and the in built flash fires at up to 7 frames per second. The Exilim Pro EX-F1 weighs around 23.6 oz and is expected to be in stores in march with a retail price of $999.99. This model incorporates a high speed CMOS sensor and a high speed LSI processor. With this model, Casio has achieved an ultra-high speed 60 frames per second (fps) burst rate for still images, together with 1,200 fps high speed movie recording that captures movement faster than the eye can see for ultra-slow motion replay. Moreover, the new model can record movies at full High-Definition…. The EXILIM Pro EX-F1 incorporates a new high speed CMOS sensor and high speed LSI processor. After building in 6.0 million effective pixels and a 12X optical zoom, the developers focused on achieving a burst shooting speed capability that was hitherto unheard of. Using the camera’s ultra-high speed burst shooting for still images or its high speed movie recording mode, users can capture a split second’s movement with greater detail than before, allowing them to catch each decisive moment, and even motion that the human eye cannot ordinarily perceive. Using the still image burst mode, users can shoot at an ultra fast 60 frames per second. In burst mode, the frame rate can also be varied from between 1 and 60 frames per second while shooting. Up to 60 shots can be taken at once, so 60 shots per second for one second, or 5 shots per second for 12 seconds, are possible. Users can record images not just at the instant they press the shutter button, but before! Continuously recording at up to 60 images per second, a maximum of 60 images can be saved in the camera’s own buffer memory even before the shutter button is depressed. Even if users press the shutter a little late, they will still be able to catch that vital moment. Users can take photographs while, in the monitor, the momentary action that is before their eyes is displayed in slow motion. It is just as if they have slowed down the passing of time. Users can unhurriedly observe the motion of the subject as they press the shutter, ensuring that they never miss that crucial moment. It is possible while using flash to take up to 20 continuous shots at a speed of up to 7 frames per second, so even in low light, no more missed shots. Also, the internal LED light allows high speed burst shooting at between 10 and 60 frames per second. The EXILIM Pro EX-F1 can record high speed movie footage of motion too fast for the human eye, for ultra slow motion playback. Users can select a recording speed of 300 fps, 600 fps or 1,200 fps. There is also a Movie Button that lets users quickly start movie recording without first switching from still image mode. The camera features Full High-Definition movie recording capability. Users can record beautiful movies at a screen size of 1920×1080 pixels, at a rate of 60 fields per second. The camera can be connected to an HD compatible television with a separately available HDMI cable to enjoy viewing movies. This entry was posted in Casio and tagged Casio, Casio EXILIM Pro on March 11, 2008 by jonathanb.